I guess that is easier to take from a man who has risen from the dead. Clearly Jesus has authority over the processes of nature and over death. And he has authority over the lives of men and women. God, by raising Jesus from the dead, has shown them that he is the Messiah, the One who He promised to send as his ruler, who has authority over all people and over all rulers. 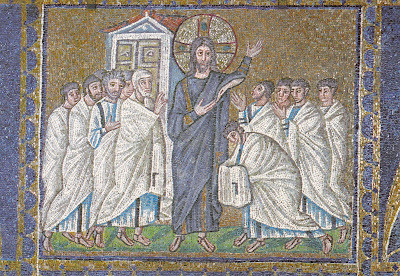 Today we are looking at the last in the cycle of very early C6th mosaics that can be found in the church of St Apollinare Nuovo in Ravenna, which depict the life, death and resurrection of Jesus. We see Jesus appearing to the 11 disciples. This is the second meeting that the resurrected Jesus has with his disciples – a week after his appearance to them on the first Easter Sunday. Jesus is showing his wound (we only see the wound on his side, presumably where he was stabbed with the spear), but in so doing he points us to our right. All the way through this cycle of 26 mosaics, there has been a movement to our right. In most of the mosaics, one of the figures moves us on to the next. Now here at the end, Jesus himself moves us on, but this time upwards, to heaven. The first followers had lived for Jesus. They had put their trust in Jesus. They had hoped that he was the Messiah. ‘We had hoped that he was the one who would redeem Israel’, say these two people as they walk on the road from Jerusalem to Emmaus. And the Messiah, for Jews, was the one who would come as God’s ruler. He would establish God’s kingdom of peace and justice. He would not die, but would bring an end to death. And when he reigned, those who had died would rise. There would be a general resurrection from the dead – some to eternal glory, some to eternal shame. These followers had staked their life on the conviction that Jesus was the Messiah.